There are busy days on Bror Nilssons gata 4. For months we have been working hard to finish some of the most advanced systems there are in the recycling industry. Systems that make electronics stay in use and not become waste. Next week we aim to be ready and done. And before we are shipping the latest collection we would like to show it to our friends, colleagues, geeks, treehuggers and all other nice people who also want some glögg and gingers and meet our team and everybody else that will mingle with us. If you would like to join us we will be very happy. Send an email to johanna.reimers@refind.se so we now how much to bake! 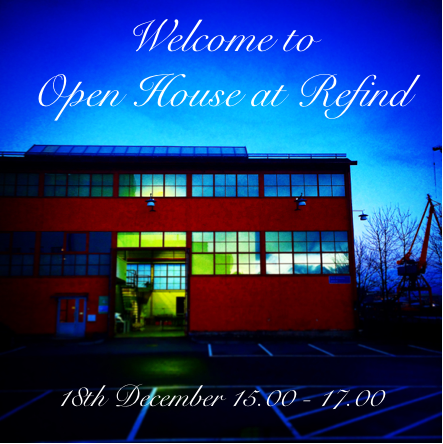 Time: 18th december, 15.00-17.00. Address: Bror Nilssons gata 4E. Bus stops: Lindholmspiren (by boat) och Regnbågsgatan (by bus). Newer PostWEEE ID - a research project with intelligent results!